Last Wednesday evening, the girl’s lacrosse team hosted their second annual late night pancake dinner. 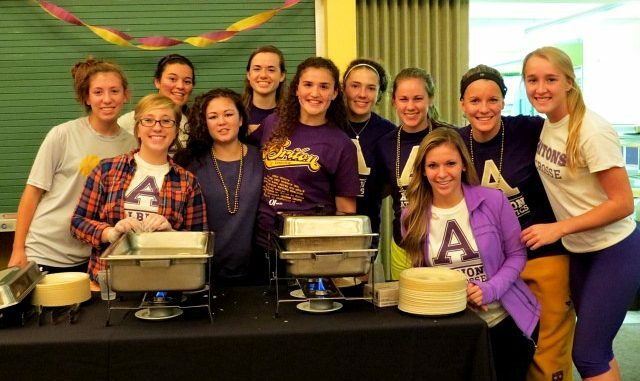 The team was serving chocolate chip pancakes until midnight in Upper Baldwin. The evening came complete with syrup, orange juice and a performance from Euphonics, not to mention the Minute-To-Win-It games where the students could win prizes. It was only five dollars at the door to help out the team and gain access to unlimited pancakes. Shortly after, the entertainment switched to a series of short Minute-To-Win-It games such as trying to stack three tubes of chap stick on top of one another using only chopsticks. There was also music throughout the night provided by DJ Paul Stewart. The team is fundraising for a training trip to California, according to Captain Ashley Glenn, South Lyon junior. They are hoping the dinner helps them cover some costs of travel so they can practice and play a few games out on the West Coast. Many Albion students showed up for the event. Whether it was for the food, performances or games, the students enjoyed themselves well into the evening. Stephanie Norwood, Dearborn Heights first-year, participated in the event. “I came to pancake dinner because there are girls on my hall who play lacrosse, and I thought it would be cool to hang out with some other students,” Norwood said. I asked the captains why they decided a late-night pancake dinner would be the best way to fundraise for their training trip. This is the second year the team has thrown this event, according to Mackenzie Novak, Waterford junior and team captain. The lacrosse girls are proving that there is no better cure for boredom or hunger than chocolate chip pancakes.